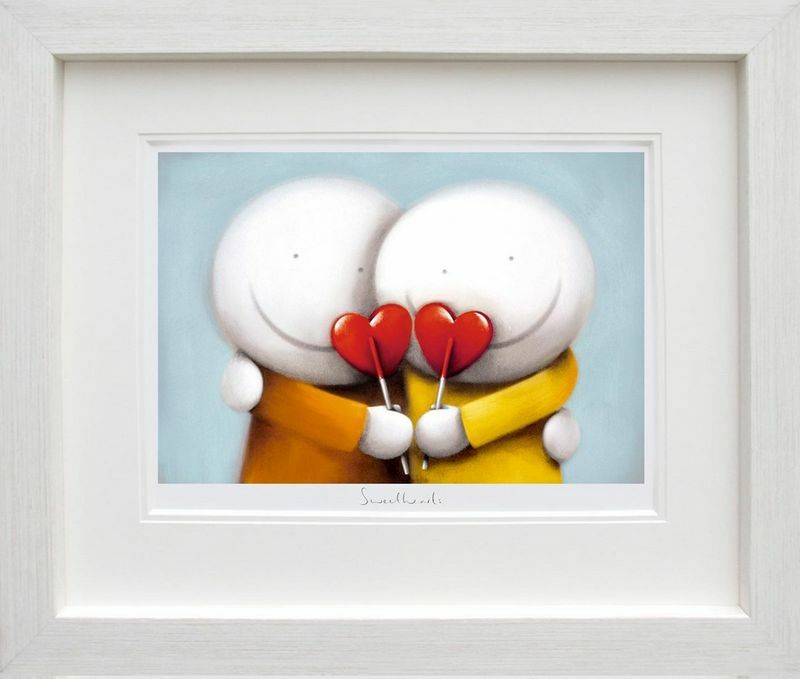 Sweethearts - Framed - framed by Doug Hyde // £524.40. The two friends in yellow and orange clothes, embrace and share a hug as they enjoy their tasty heart shaped lollypops! An image full of love, light and all things nice, ‘Sweethearts’ is a print purely about love and affection & having fun in the world. Almost hugging ‘for the camera’ there is childlike innocence about this artwork, as we admire the affection the two characters have for one another and are curious as to what the lollypops must taste of! My guess is one is raspberry and one is strawberry and in the next moment, like a couple entwining arms and sharing a glass of wine, these two share lollies. The cool, light blue background works perfectly with the red of the hearts and the yellow-orange of the characters, set against white and grey faces; Doug is exceptionally skilled at picking the right colour palette for his paintings. Another welcome addition to Hyde’s limited edition art collection.